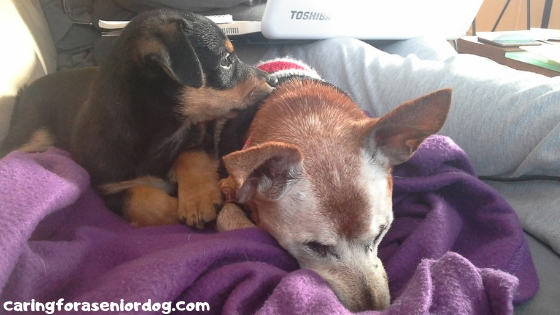 If you have a dog with dementia like I do, then I can relate to what you’re going through. As tough as the disease is I feel like the toughest part, at least for me was trying to figure out what was going on with Red. I never had a dog with dementia before, in fact I knew nothing about it, the symptoms and certainly not what to do about it. There are so many pet parents struggling with how to care for their pups who have canine cognitive dysfunction (CCD), I wrote this post to share my experiences so you’ll know you aren’t alone, and hopefully it will help you find relief and some answers. The picture above is of Red, the love of my life, and the cute puppy next to her was a foster. When your dog has dementia you live for those moments when they’re resting. Red had dementia for about 2 1/2 years, and I admit there were some challenging times. If I’m honest they were more than challenging, they were “I need to get out of this house right now because I can’t take it any more” times. It’s important to know this disease doesn’t only affect your dog, it has an impact on everyone in the household, especially the primary caregiver which was me! I found that most of every day was devoted to making sure she was okay. Whether that meant balancing my laptop while sitting on the couch rather than at my desk so she could sit with me (like in the picture above), taking her out umpteen times to pee, trying to calm her down when she circled endlessly or hand feeding her because she wasn’t always quite sure how to eat at times. I have adopted a few senior dogs over the years, but all their problems were eyes, ears and kidney related. When Red’s behaviour started to change, dementia never even entered my head. There was a period of a few weeks when she paced endlessly, and nothing I did helped her settle. She would go on her bed for a few minutes, get up and wander, have a drink, pee and repeat. I covered my entire floor with pee pads because she seemed to forget she was a perfectly house trained little pup!! I remember one evening she paced for 4 hours, I was stressed beyond belief and when I could no longer cope I closed the door and went to bed. Not something I would ordinarily do, but I needed a break. Thankfully she eventually fell asleep. Red had kidney issues and also wasn’t concentrating her urine around that time, so I naturally assumed these behaviours were connected. Needless to say I was shocked when her test results were fine. A couple more visits and my amazing vet still couldn’t come up with an explanation…first time ever!! The word “dementia” was never mentioned as a possibility. This situation is a perfect example of the importance of knowing your pets. My vet couldn’t find anything wrong with my dog, but because I knew her so well I was positive there was a problem. A couple of days later the words “doggy dementia” popped into my head. I have no idea why because, like I mentioned earlier I had no experience with this disease and knew nothing about it. All I can say is I’m grateful it did. I went to my vet with my diagnosis and he agreed it made sense. Red had never displayed any unusual behaviour during her appointments so my vet only had my observations to go by. I recommend you take notes of all behaviours you’re concerned about, and if possible a video as well. That video can go a long way to helping your vet make a diagnosis. I am including this printable checklist for you to fill out and take to your appointment. It is another tool to help him determine if your dog does have dementia. My vet prescribed Selgian here in the UK (Anipryl in the US and Canada), and by the third day I noticed she had calmed down significantly. My vet also recommended Nutracalm twice a day, sprinkled on her food. It is a natural calming supplement manufactured in the UK and available through vet offices here. I don’t know if it’s available in other countries. I added Nutramind (made by the same company), a capsule containing high strength Omega 3s, vitamin E, B vitamins and Ginko Biloba. The other thing I did a lot at the beginning was play a CD called Through a Dog’s Ear. It is bioacoustically engineered classical music proven to help calm dogs, and it worked miracles. When Red would start to pace endlessly I would play the CD and within one minute she would be resting. The music is so beautiful and calming, it helped me relax as well. You’ve taken your dog to the vet, you’ve started treatments, you’re playing the calming CD, and you’re loving her. That’s all you can do. Wait, there is one more thing you can do and that is take care of yourself. I hate to admit it, but I didn’t always cope as well as I would have liked. It was unbearable seeing my precious Red like that. She was the love of my life, and I was helpless. She was also blind so I had to be extra aware of what she was doing and separate what was due to blindness, and what was not normal behaviour for her. Because I work from home (running this website), I was with her all the time, and didn’t get much of a break. At times I found myself close to breaking point, helpless and stressed. I left my husband in charge a few times when I had to get out of the house. One day I went shopping, one evening I went for a brisk walk along the beach, sometimes I listened to guided meditations. Go to a yoga class, meditate, go shopping, have dinner with friends… Whatever you like to do to unwind or escape, do it. It will help you stay calm and patient while helping your pup cope. After about a year I noticed dementia once again started to rear its’ ugly head. I always have my dogs on a routine, and it was super important for Red to stick to that routine. She had been a very well traveled dog since I adopted her, flying between Florida and the UK a couple of times a year, a visit home to Toronto from Florida, and lots of bus and train journeys. She also used to love riding in her stroller. During the last year of her life she was much more antsy, unsettled on day trips and could no longer sit still in the stroller. Other than her usual walks she was much more comfortable in familiar surroundings. I had to hand feed her a lot and she preferred her canned food baked. I do not believe in heroic measures, keeping my animals with me no matter what just because I can’t bear to say goodbye. From the day I got Red when she was around 8 years old I would always say that I couldn’t imagine life without her. Well, that day I couldn’t imagine came on April 18, 2018. She had lost weight, wasn’t eating well and the day before I had found out her urea levels were through the roof. It was her kidneys that got her in the end. I chose not to let her go that Thursday when we were at the vet’s office getting her results, because I didn’t want to do anything rash. When I got home I called and made the appointment for the next morning. If you notice your dog circling, wandering aimlessly, getting stuck behind doors, not seeming to recognise you, having trouble eating or anything else out of the ordinary please see your vet right away. Dementia can only be diagnosed by a process of elimination, so if all test results come up normal, mention the possibility of dementia and start your dog on medication right away. There are also supplements and alternatives many people have had success with such as Melatonin, Omega 3s, Valerian, a Thundershirt and CBD oil. If your vet cannot help you, speak to a holistic vet for additional treatment options. Does your dog have dementia? What behaviours did you notice that had you concerned? Do some of the symptoms sound familiar but you don’t have a diagnosis yet? Please leave your comments below and I will do what I can to help. Shame, that is horrible and it must be terribly hard on you. At least now you know what the problem is. I wonder if our Labrador we had last had dementia. It never occurred to me that might be what he had too. He definitely was blind and deaf and had arthritis… but he seemed a bit out of it at times but I put that confusion down to his failing senses. Hi Lynne, It can be quite difficult to diagnose dementia, since many of the symptoms are similar to other issues. I had a blind and deaf dog as well, and sometimes she would just be standing in one place “staring” at the wall. I don’t think that was dementia, I think it was a result of her lack of senses. Shame what some of our pets have to go through, and it can be difficult knowing when enough is enough. Thanks for this information. It was very interesting. I had never considered my dog may have dementia until recently. The signs you were discussing are almost identical to what is happening with my dog. It makes sense and it is funny how dementia in a dog is quite similar to that in a human! What is Selgian and where do I get it? Thanks in advance. Hi David, yes it is very similar. In order to be sure your dog has dementia, it’s best to take him to the vet to rule out other possibilities, unless you’ve already done that. Symptoms of dementia are very similar to other illnesses. Selgian is a medication they use here in the U.K. Anipryl in the States I believe and it’s by prescription. There are also many alternative treatments available if you were interested in exploring that avenue. I have an article publishing on the 18th about alternative options. Once I had a diagnosis confirmed I would find out what options my vet could offer (although I don’t believe there are other medications, at least none my vet mentioned), and I would be curious to know what treatment plan a holistic vet could offer. Let me know how you get on. Hi Hindy, I can totally relate to this. I was just visiting my brother over the weekend. He and his wife have three dogs and Bobo, their oldest, has began showing signs of dementia. He does not get anxious like Red does but he seems to get confused. He is such a lovable dog, though and still a joy to be around. I hope he has received as much joy from his people as we have received from him. Thanks for writing this. We were unaware that there might be a medication to help Bobo. I’m going to forward this to my brother so he can ask his vet about it. Hi Christian, glad this article was so timely. Hopefully your brother has taken, or will be taking Bobo to the vet, just to rule out other possibilities. If he does have dementia, there is definitely medication available, but there are also a lot of alternative treatments if your brother was interested in exploring that route. I have a post about it publishing on the 18th. A holistic vet would be the one to consult with about possible courses of action to take. The earlier Bobo starts treatment, the better. Let me know how he gets on. what a touching post! Your care for your animals certainly comes across. I can just picture Red sitting next to you right now 🙂 As you know, my friend’s dog has dementia (the signs are all there). She was just telling me how her dog was just going in circles, whining, seemingly afraid of everything. she has tried a lot and has a good relationship with her vet but it has taken a toll on her. Her dog also has numerous health and physical issues. So after a lot of thought and heart ache she has decided to have him put down. Huge decision but I will try to be there for her. Oh Emily, I remember you telling me. I’m so sorry to hear that, I know how gut wrenching that decision would have been. My friend recently lost both her dogs within a few weeks of each other. We used to volunteer together and we know each other’s dogs, and how we feel about them. There’s not much to say, except to listen. One thing I did for her, if you’re interested. Here is a link to a website http://www.in-memory-of-pets.com/ where you can light a candle for her dog. Go to candle light ceremony on the left hand side, then To Submit Your Own Candle Light. You just submit the name and day he died and they will send you the link to see the candle, which you can then send on to your friend. I did that for one of my dogs, and although I have never gotten over the loss of that particular one, it made me feel a little less helpless. I hope this helps. Let me know. This is exactly what we are experiencing with our 15 year old dog, Bandit. It came out of no where! I have been looking for natural treatments also. Thank you for writing this page!!! Hi Monica, I’m so sorry to hear about Bandit. I’d be interested to know if you manage to find any natural treatments that are effective. What are you doing for him at the moment? I did take Red to a holistic vet who did not have anything natural to recommend. I mentioned a lot of the items from my post, but because he didn’t have experience using them he would never advise trying something he has not tested. I did try the coconut oil after asking my other vet, and although I gave her a much lower dose than suggested, she developed a touch of pancreatitis so I stopped it there and then. She’s doing fine on Selgian (Anipryl in the U.S.). Please keep me posted. My dog has dementia and my vet is amazing but there is nothing that helps his barking and whining…when it gets gong it doesn’t stop. in the middle of the night , all morning …its awful and I am becoming more and more irritated by it. I have had another dog with dementia and it was two of the most trying years of my life that I fear I can’t repeat. If this next bout of natural brain supplements doesn’t help along with all I am doing now I will have to put him down. He has one back leg that works so walks are hard on him, he is anxious most of the time if he’s not sleeping which seems to be happening in shorter and shorter rounds…it’s hard on me and my husband as we are awake at all hours. There is NOTHING easy about dog dementia, including the coping. Hi Carmen, I am so sorry to hear what you’re going through, and I know how you feel. Dealing with a dog with dementia can be incredibly stressful, and we even find ourselves losing patience. There were times before I realised Red had dementia when I couldn’t cope with her wandering for hours at a time. She’s blind so it’s even worse. For the sake of my sanity I would have to go out for awhile – a long walk to the beach, a bit of shopping anything to take a break. I’m glad to hear your vet is amazing and I assume supportive as well. You know your dog better than anyone and I have no doubt you want only the best for him. At the end of the day the only thing that matters is their quality of life. It’s more than heart breaking to have to say goodbye, but as you know it isn’t about the pain we’re going to feel, it’s about doing the right thing for our animals who rely on us. I don’t know what treatments you’ve been giving your dog, but I know Selgian (I’m in the UK) or Anipryl in the US has really helped Red. When she wouldn’t settle I would play a CD called Through a Dog’s Ear which I bought. You can find an 11 minute or so snippet on YouTube and see if it helps. I could suggest a stroller for when your dog can’t walk, and acupuncture has been known to be of some benefit but like I said earlier, quality of life is all that matters and yes dementia is so difficult for us to cope with. Red has had it for 2 1/2 years, and lately I’m seeing she’s been getting a bit worse. I know that one day, sooner rather than later I will have to make that decision as well. Please contact me anytime you need to chat, have a question or simply need to vent. Thank you for your reply…Yes Chip has been on Selegeline (Anipryl went off the market before he started with this stuff so my vet had a script done-same stuff basically). He also has been on high dose Omega 3’s and Trazadone for anxiety and when it gets terrible? Xanax..but that doesn’t seem to help much. He is deaf so music doesn’t help and the YELPING (so loud it echos) doesnt even stop when I am holding him…his head jerks (vet says its the brain wiring just not firing right and its making him more anxious) and it’s awful. Last night was the worst…he would NOT settle down…I have been awake since 4 am. Even shutting him in another room doesnt work bc the yelping is THAT loud. We are all awake, the other dogs are up at 4 am to eat bc of him….I have one more supplement coming in that is supposed to help the brain but I just don’t know if I can keep this up. He has had a walk (mostly I carry him but I want his eyes exposed to the light to regulate melatonin, had two bones, pooped, peed had water and is literally sitting there yelping right now at me. I was super patient with my other dog…and she finally lost her spark so it was time. This guy won’t stop moving and whining. I am just lost. I have put down 7 pets in my life, but they were obviously physically ready….is mentally ready the same reason? I am beginning to think it is. How happy can he be not able to walk the same, chase squirrels, sleep and play and anxious 15 hours of the day? 🙁 My heart breaks. I know your heart breaks, and in my experience I found that making a quality of life decision was way harder than a decision made based on illness. Only one time has it been quality of life and it was my blind and deaf dog Josephine. I questioned myself a lot afterwards – did I wait too long? Should I have waited longer. Having said that it was a different scenario than the one you are facing with Chip. Sometimes I try and imagine what they would want me to do. There are times when dementia is so far advanced nothing will give them peace, except to let them go. I’ve had to say goodbye too many times and I can’t even bear the day I will have to say goodbye to Red. What I do know is when things get bad for her I will accept the pain I know is coming and do the best thing for her. I know how hard it is to see things objectively because you’re so emotionally involved, but perhaps if you re-read the comments you’ve just written you may find the answer you are seeking. Hi Carmen, I’ve been thinking about you the past couple of days, wondering how you and Chip have been. I’m sorry it’s time to say goodbye it’s awful even thinking about it, but if you’re at peace with your decision (which you obviously are) that’s all you can ask for. It’s certainly not my place to comment but that never seems to stop me! but based on everything you’ve written it sounds like you are making the right choice for your dog. You have done everything you possibly can and that’s all you can ask of yourself. It absolutely never gets easier, but imagine how much emptier life would have been, at least that’s the case for me, if you hadn’t shared your life with each of them. Just imagine he will be happy and healthy and running with the rest of the animals we’ve said goodbye to – at least that’s how I choose to look at it. I’m here anytime and I am sorry. Hi, have just read your story. I have a 15 year old Jack Russell, she is deaf and has dementia and demands attention the whole time she is not asleep. She is quite hyper, racing round the outside of my bungalow up to 20 times at top speed. She has started biting me for attention, not too painful as she has very few teeth left. It is difficult to walk her off the lead as I cannot call her back, and she is quite likely to forget where I am and go off in the opposite direction. She als weeks in the house, even if she has just been out. She is on a hormone drop for incontinence. I walk her twice a day on the lead, though she is often reluctant to go for a walk. I love her to bits I have had her from 6 weeks old, but I get quite tired coping with her. The vet says she is fit otherwise, and she is ideal weight. I may have to make a decision. Hi Rosemary, thank you for your comment. You don’t mention any treatment for her dementia. What are you giving her for that? 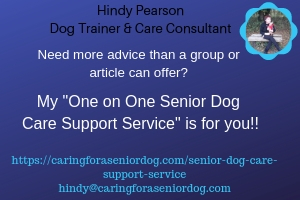 May I suggest you join my Facebook group Senior Dog Care Club. You will find lots of support and advice from other members, I’m sure you will find it helpful. I’m so sorry Erin, I know how hard it is. 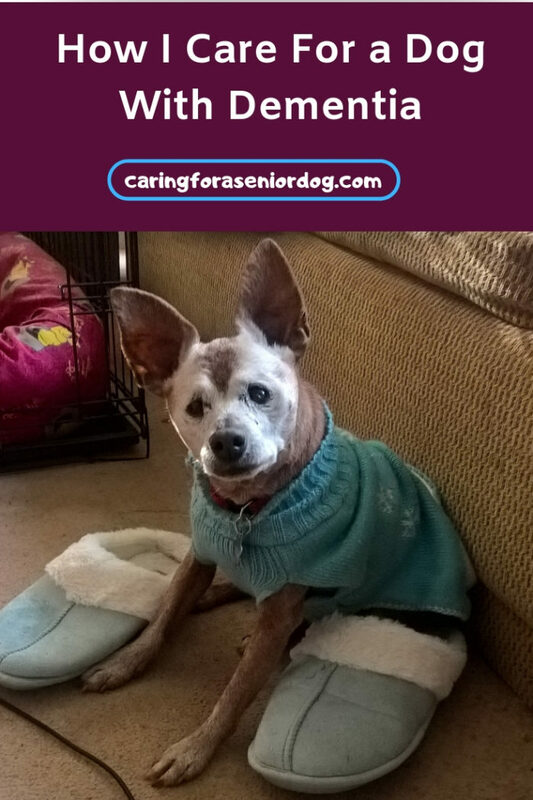 Why don’t you join my Facebook group – Senior Dog Care Club. The members are amazing, helpful, compassionate and full of great ideas. There is tons of information about dementia and treatment options, and on this website there is a post about natural treatment options as well. I hope you’ll join us and join a community where others, myself included, can understand your struggles and we will do our best to help you. Just read your article and all the comments from everyone. Your article really hit home for me. I’m completely moved by it and feel exactly the same as you. My Rocky is a 17 year old Pomeranian, who I think has dementia. About 2 weeks ago, Rocky had a very bad case of diarrhea for 2 days. I rushed him to the vet and they prescribed him some meds that helped. He’s normally 9 lbs, but lost 2 lbs from being sick. Rocky’s blood test came back pretty normal considering that he’s 17. I went in for a follow up this past Friday and was so surprised to see Rocky’s retired vet show up. Dr. Noah was just filling in for the Dr. G, who’s on vacation. After examining Rocky and hearing the symptoms I described, he suggested that Rocky might have dementia. It was super busy at the vet’s office that day, so Dr. Noah asked me to keep an eye on Rocky over the weekend and to follow up this week. I didn’t know dogs can have dementia. After reading many forums, it’s very clear to me that Rocky has it. Yes, his health has been declining with age, but all those symptoms makes total sense now. Like Red, Rocky paces all day from the moment he wakes up until bed time. It’s as if he has an anxiety attack that lasts all day. I have to hand feed him all the time now. He gets lost in the house if he takes a wrong turn and gets stuck under the table often. It’s a good day when he actually eats a fair amount, but bad day when he just doesn’t want to eat. 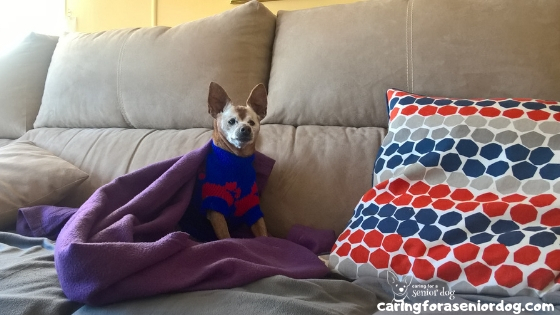 Rocky has a heart condition and lung issues, so he’s on several different medications. Spoke to Dr. Noah today, he’s not comfortable prescribing him Anipryl because of his heart condition and doesn’t think that would help much at this stage. He did suggest Prozac and asked me to think about that option. My heart is completely broken. He’s my first and may be my last because I honestly don’t think I can do this again. I’ve had Rocky since birth, it just breaks my heart to watch him like this. I have anxiety issues myself so watching him this way stresses me out and depresses me. I live with my retired mother, so she watches Rocky while I’m at work. My work hours are the same everyday so I watch him from early evening through the night. I’m not very active on social media at all, but after reading your story.. it was hard not to reach out. I feel like I’m not taking care of myself and seem to just be sad all the time. People sympathize with my situation, but no one really understands how it truly feels unless you’ve went through it yourself. Luckily for me, Rocky sleeps through the night. It’s just hard to get him to fall asleep. It’s been suggested that I consider putting him down, but I’m not sure how to make that decision. He’s eating even if it’s a little here and there. He’s walking and sometimes running fine, although he does have athritis towards the back spine and hind legs. Are dogs with dementia generally unhappy? Am I being selfish? I’m currently giving cbd oil a try and will monitor him closely. Anyways, I’m extremely grateful to have stubbled on your post. I’m trying hard to not dwell on the sadness just to get through everyday. You’re truly amazing for sharing your story and the support you give to everyone on this forum is admirable. Caroline I’m so sorry to hear about what you’re going through. 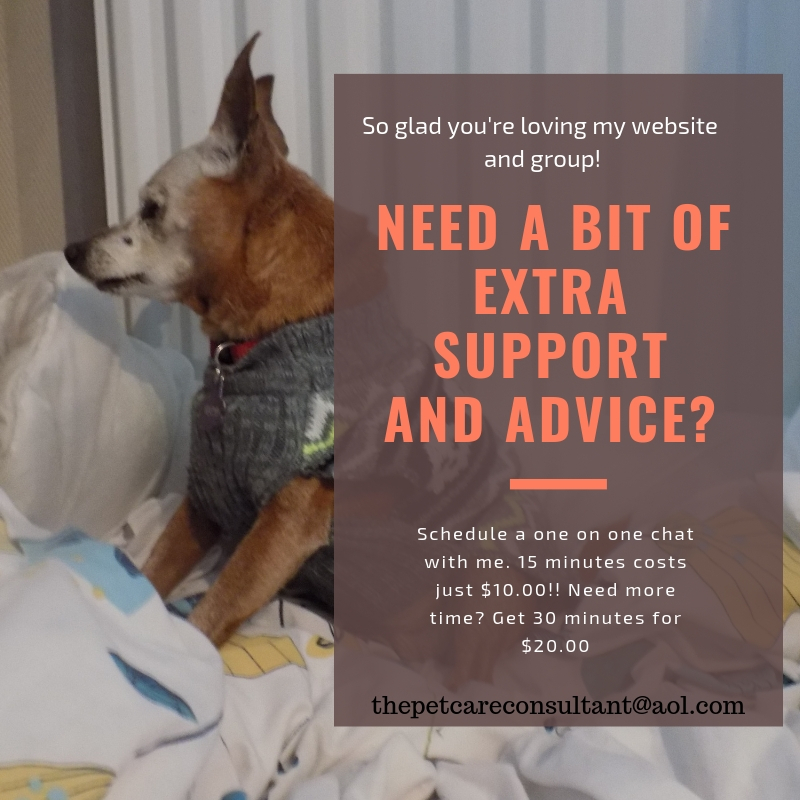 My best advice would be for you to join my Facebook group, Senior Dog Care Club. The members are incredible, tons of helpful tips and advice, and most importantly an incredibly kind community of people who are in very similiar situations. We are the one place where we really “get” what others are going through. I hope you’ll consider joining and get the support you’re looking for. Thank you for writing this post it is very informative and extremely helpful, our 15 year old patterdale terrier Alfie has just started showing signs of dementia, circling, staring into space, pacing up and down, he even fell over this morning it was absolutely heartbreaking to see and I rushed to pick him up and cuddle him in an effort to reassure him. Alfie recently had surgery to remove so unharmful lumps and it appears to have become worse since he had his surgery almost 3 weeks ago! Like yourself i work from home so I’m with him 24/7, he sleeps most of the day and is in a good routine which I know for dogs with dementia is crucial as any change can be unsettling. I called our vet this morning in tears of distress after watching Alfie struggle in the garden and then fall over in front of me which was so heartbreaking, I explained what had happened and how quickly these issues started to rear their ugly head! We like yourself, have been using Nutravet products for sometime as Alfie has arthritis in his legs which we use Nutraquin + for which we have to say has been amazing, we also use nutracalm for stress and anxiety which has also been amazing at helping him calm down and he is currently taking Nutramed this is to support his system overall after his surgery and he has this for one month but the vet said we could use it permanently is we wanted to. This morning we were told about Nutrmind and in line with a medication which we are due to collect from our vet today as we are keen to start treatment asap to help Alfie with these horrible symptoms in the hope for a better quality of life for him, we love Alfie more than the world itself and will do all we can to help him through his later years. We will alo try the dog calming cd, I regularly listen to classical music while working and believe Alfie likes this too 🙂 I have always loved listening to classical music so Alfie has been exposed to this since we first collected him from our local rescue centre. 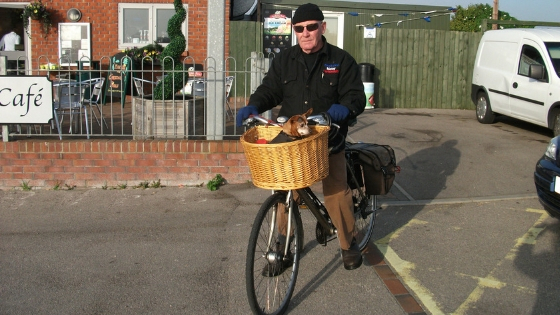 We are wishing Alfie a good quality of life now in his later years and will do all we can to ensure he is comfortable. Hi Lucie, sorry to hear what’s been going on with Alfie. Why do you feel his falling over is dementia related? It sounds like it could be vestibular disease, which causes dizziness and balance issues. It usually passes on its own, and there isn’t a treatment for it as far as I understand other than for nausea if that’s what they’re experiencing. Glad to hear he’s doing better. There are so many options to try for dementia. I’m wondering why you pick up the water bowl? Did your vet recommend that? Sometimes it can be dangerous to not let dogs near water if they need it, and in many cases it makes no difference to the amount they have to pee. Covering the floor in pee pads meant Red didn’t have to wake me up in the middle of the night to pee. Hey Hindy , Bailey drinks tons of water all day and the water bowl is picked up at 8 pm. It helps him sleep through the night now . I think the meds make him very thirsty. The vet did not suggest any drugs for dementia since he is towards the end and we have been managing quite well of late . Having a lot of experience with dementia in humans as we were a care giver to my mom in law, the meds eventually just made her out of it and that was hard on us . We don’t want Bailey drugged us and out of it either. When they are in that state , there is no quality of life . He is on Bright Minds by Purina Pro and that has helped . The Belly band has been a godsend so he will be enjoying more time with us until his bowels go again . He has had an amazing acreage life and I can’t wait for winter to end to get him out for walks again . He can not tolerate cold anymore . Till that time comes , we will enjoy every day he is with us . This blog will give so many struggling some options with dealing with our aging pet . There is no quick fix but at least we learn how to give them more quality time . Hi Nancy, sounds like Bailey has a great life, he’s one lucky pup!! Bright Minds definitely has some good research behind it, and I know belly bands have been a lifesaver for many. The medication never affected my dog, but I know what you mean. The only thing that matters is their quality of life and I know you’re treasuring every moment of yours together. HI Hindy- for starters – I am very sorry for your recent loss. Would love to talk to you. Sounds like our lives are pretty similar. I’ve adopted senior poodles for the last 12 years of my life. I have 2 jobs because if them. It’s 4:45 am- and to be quite honest- being up at this time is pretty normal – as a result of taking care of my senior dog Charlie. I’ve joined your Facebook group and your Facebook page liked it tonight. Sounds like you recommend any new members to join. Your Facebook group – so I did that. I don’t have an official diagnosis- of Dementia.. I’ll proably get that after our Neuro specialist vsisit.. but to be quite honest. My Charlie is in my opinion advanced dementia. Started last summer walking towards the left… couldn’t keep his eyes on my straight ahead and would vere off to the left after a few seconds.. then for the past couple years… been dealing with UTI’s that are officially now not UTI’s since we just did 3 cysto’s and all were negative. I don’t know where to start… Charlie is deaf and 99% blind… so – many of these symptoms I thought were sight related.. but I feel Dementia now related. We thought he had urgency to pee or poop and he would keep walking in circles and swirling and swirling – sometimes for 1/2 hour… and where I’m gone- hours on and off. Will ore and walk in his pee when I’m gone for a couple hours… he does sleep soundly/ unless he has to pee – or cough- as he has copd. But I guess why I’m writing this is- his circling is much worse over the past couple months.. sometimes I have to pick him up to stop him… and he still wants to walk In circles… but there are some diffenwrces – he typically can get out of a corner or back up when Stuck.. but not always.. I’m just wondering if at this stage if it is Dementia- and I would be my house on it.. would any of the recommended supplements or prescription meds help at this point. I could go on and on.. and would like to.. is there a way to talk to you or reach out? Hi Dawn, thanks for reaching out. The group is the best place to get advice, it’s such a wonderful, caring and supportive community. I pop in there as well and offer any support I can. Dementia is diagnosed by a process of elimination. When tests come back fine and there is no other explanation for certain behaviours, that’s when it’s believed to be dementia. Perhaps your dog has vestibular disease? Has he been to the vet recently for a check up and blood tests? Have you added an extra meal if he’s so hungry? Hi Christie, I can’t imagine how adorable Baby must be!! I understand guilt very well, but I also know I was able to take much better care of Red when I was able to get out of the house, have a change of scenery and recharge. You should definitely join the group, it’s a wonderful community and the one place everyone will understand you!